Cartoon Network has announced that they’ve given the go-ahead for a pair of new animated TV series — Steven Universe and Browngardt’s Uncle Grandpa. Both are expected to debut sometime in 2013. Having scored its most-watched summer in its 20-year history across early primetime, Cartoon Network has greenlit two animated series conceived as part of the shorts development initiative underway at Cartoon Network Studios in Burbank, CA. Steven Universe, from Adventure Time writer and storyboard artist Rebecca Sugar, and Uncle Grandpa, from Emmy(R) Award-nominee Pete Browngardt, have started pre-production and are currently slated for a 2013 debut. Building upon the global success of recent artist-driven series like Adventure Time and Regular Show, both new series will further define the genre of homegrown animated comedies coming from Cartoon Network Studios. Sugar’s Steven Universe is a coming-of-age story told from the perspective of Steven, the youngest member of a team of magical Guardians of the Universe. Browngardt’s Uncle Grandpa is based upon the Emmy(R)-nominated short of the same name and follows the exploits of Uncle Grandpa – everyone in the world’s “magical” uncle and grandpa. Pete Browngardt’s interest in animation developed early. The youngest of five children, Browngardt was making animated Super 8 and stop-motion films while still in grade school on New York’s Long Island. After studying character animation at CalArts, Browngardt started working professionally for Futurama at age 19, followed by stints with Industrial Light and Magic, Augenblick Studios and MTV Animation. 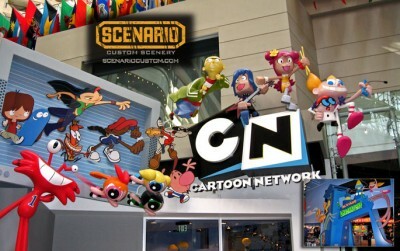 Since then Browngardt has worked on a number of Cartoon Network series including Chowder, The Marvelous Misadventures of Flapjack and Adventure Time. Most recently Browngardt was the Creator/Executive Producer of the Cartoon Network animated series Secret Mountain Fort Awesome which won the Annie Award for Best Production Design in a television production, the “Cristal” for Best TV production at the Annecy International Animated Film Festival and two juried Emmy(R) awards in 2012. Cartoon Network (CartoonNetwork.com) is the #1 U.S. television network among boys 6-11. Currently seen in 99 million U.S. homes and 178 countries around the world, Cartoon Network is Turner Broadcasting System, Inc.’s ad-supported cable service now available in HD offering the best in original, acquired and classic entertainment for kids and families. In addition to Emmy(R)-winning original programming and industry-leading digital apps and online games, Cartoon Network embraces key social issues affecting families with solution-oriented initiatives such as Stop Bullying: Speak Up and the Move It Movement. What do you think? Do either of these shows sound like they’re worth watching? More about: Browngardt's Uncle Grandpa, Browngardt's Uncle Grandpa: canceled or renewed?, Steven Universe, Steven Universe: canceled or renewed? Cannot believe they cancelled Thundercats (read it from someone involved on the show) for stuff like this, ugh. Though to be fair, I’d probably be saying that no matter WHAT they had in the works. The only thing I’m interested in on Cartoon Network now is Young Justice. I know right! That was the best thing ever… Well, Adventure Time is best.